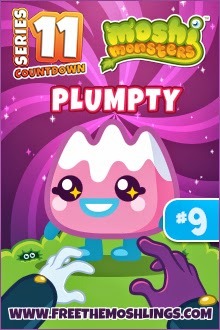 Today's Moshling is a very yummy one as he is a Pudding! He is J's favourite from Series 11. As he likes custard so much, we've let him live in our custard tin. But I'm not sure how much he'd approve of instant custard as he much prefers to do things properly, the old fashioned way, because he is 'Plumpty the Proper Pud'. Proper by name, proper by nature, these amazingly prudish Moshlings disapprove of anything new or remotely out of the ordinary. And that’s strange when you consider the fact each and every Proper Pud’s head is filled with gooey magic icing that tastes like mulled Bongo Colada. Not that they would ever dare try it themselves! Habitat: Proper Puds live in converted mixing bowls near Knickerbocker Nook but they often congregate in the shops of Ooh La Lane around Twistmastime. Likes: Custard and old-fashioned values. Come back tomorrow to meet number 8!